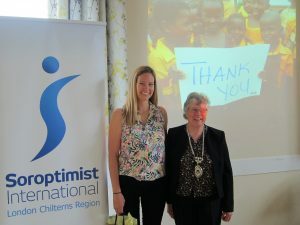 SI Newbury & District hosted the Region Meeting in Newbury on Saturday and what an impactful Region Meeting/Conference it was IMPACT is Region President Margaret Badley’s theme for the year and this event certainly fitted the bill. 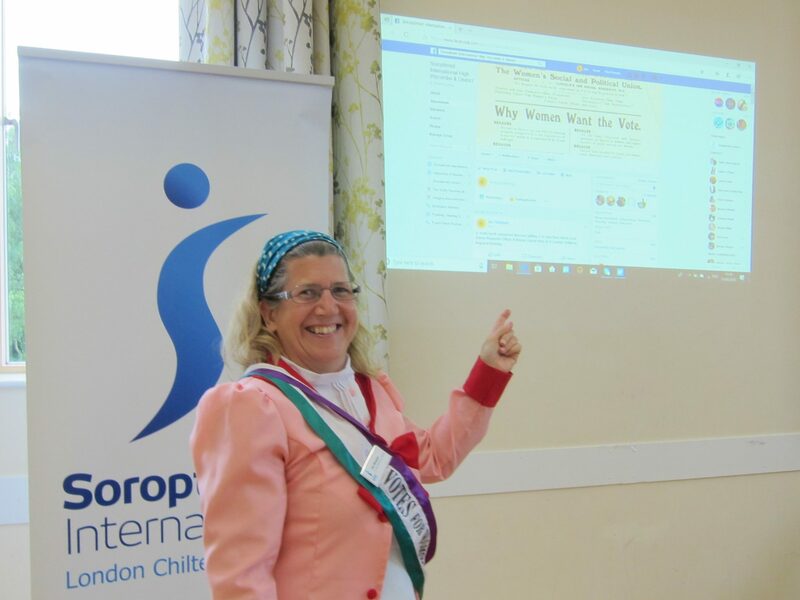 50 Soroptimists from the Clubs in our London Chilterns Region came together to learn, share and have an inspiring and enjoyable day at the Hermitage Village Hall. Sarah Albeboure from Action Through Enterprise Ghana www.ateghana.org moved us when she told us about the wonderful work ATE does in Lawra, a remote impoverished community in Ghana – Sarah, her charity and the people she supports are amazing – there was hardly a dry eye in the room. Please check out the ATE website to find out more and make a donation if you can – every penny really does make a difference. Sarah was a primary school teacher in Newbury until 6 years ago when she volunteered to go to Ghana with VSO and was so engaged by the people in the community and their needs that she set up the charity with the support of her family – and now it is her life. Inspirational is a word that is overused, but Sarah is truly an inspiration. Sarah is pictured here with President Margaret. 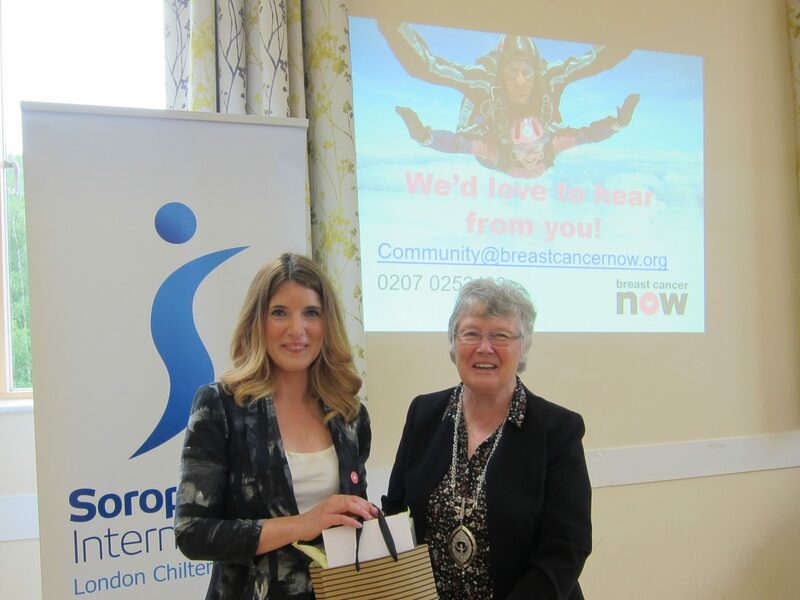 Our second great speaker was Nicole Lyon from Breast Cancer Now (pictured here with President Margaret) Nicole told us about the charity’s vision that by 2050 everyone who develops breast cancer will live and live well. Nicole gave us a packed presentation and reminded us to TLC – Touch Look Check. The session became very lively when our well informed audience asked lots of excellent questions. Breast Cancer Now are very effective at campaigning and you can get on their email list by visiting their website. BCN has found worrying new evidence that patient access to breast reconstruction surgery is being restricted by some local health bodies if you get a moment please do support their campaign by clicking on this link. The last session, led by Helen Byrne our Region Membership Officer, was an interactive workshop about Soroptimists using social media to raise their profile – pictured here is Jen Simpson from SI High Wycombe who was invited by Helen to kick off the session by talking us through her Facebook and Twitter activity for her Club. Obviously during the day everyone was fed and watered well with a delicious lunch coffees, teas, biscuits – what a great way to spend a Saturday.